As Vice President of the Business Credit Division, Pamela Bowers oversees Ex-Im Bank's Working Capital Guarantee program and Supply Chain Finance Guarantee Programs with direct oversight of a $2 billion working capital and supply chain finance portfolio. Bowers implemented the Bank's Fast Track program, which enables small and medium-sized U.S. exporters to obtain larger Ex-Im Bank-guaranteed working capital loans in less time. She also played a key role in revamping working capital guarantee documents to appeal to a broader range of customers, and increased the working capital loan portfolio from $350 million to over $1.5 billion. In September 2010, Ex-Im Bank’s Supply Chain Finance Guarantee Program was launched to provide suppliers particularly small businesses access to capital faster and at a lower cost. 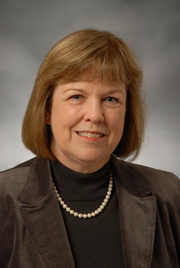 Bowers assumed her current post in October, 2005. She joined Ex-Im Bank as a loan officer in 1994 and served as a director in the Business Credit Division from September, 2004 to October 2005. Before joining Ex-Im Bank, Bowers served as a credit specialist at the Federal Deposit Insurance Corp., Monmouth Junction, N.J., an account executive/audit manager at Glenfed Financial Corp., Englewood Cliffs, N.J., and an auditor at Ernst & Young, Cleveland, Ohio. Bowers holds a Master of Business Administration degree in accountancy and finance from Cleveland State University, and a Bachelor of Arts degree in history from Miami University, Oxford, Ohio. She is a Certified Public Accountant.